Short mens board shorts in slim fit, The Rocks Push Shelly board shorts are a tailored style, designed to be worn long summer days into long summer nights. Made from quick drying fabric with Italian yarn, The Rocks Push swim shorts are made from fishing nets salvaged from our oceans. 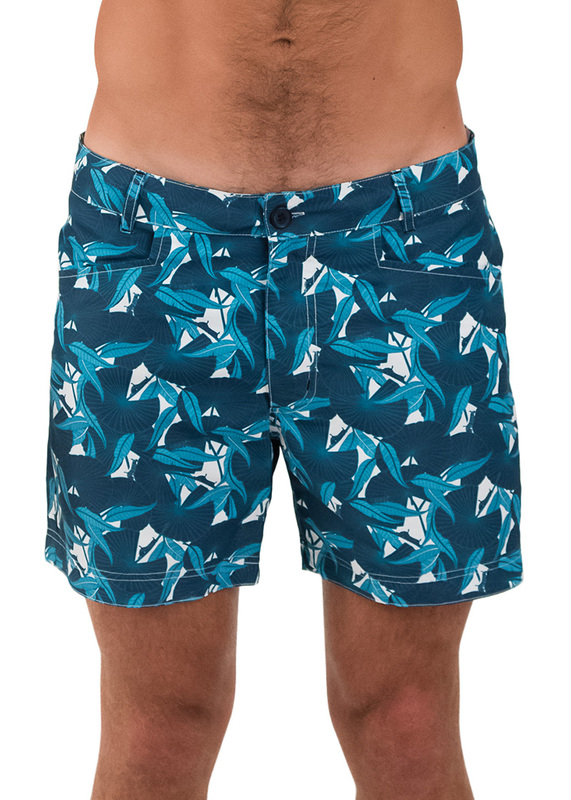 Printed with unique Australian designs that feature our beautiful Australian wildlife, our Australian board shorts are bold and colourful and a statement on and off the beach. Every pair of mens swim shorts comes packed in a carry bag made from recycled plastic bottles and includes a waterproof wallet that is tested to 18m and will keep his valuables dry while he gets wet. 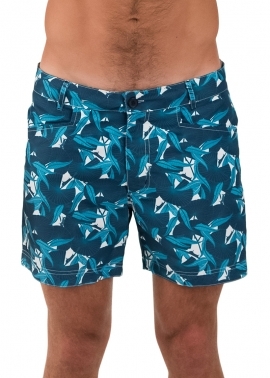 Our Shelly mens board shorts are a tailored, shorter length swim short with a slim fitting leg. Popular with those wanting a slimmer fitting short, our Shelly shorts are on trend. 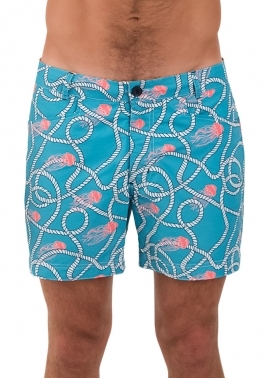 Made from Italian yarn which is made from recycled drift nets salvaged from our oceans, the fabric is soft, strong and quick drying and these shorts do not have mesh. The exclusive short-run caterpillars green print is on trend with various green hues in swaying palms with hidden creeping caterpillars. Our mens board shorts feature a waterproof wallet which slips into your back-zip pocket and will keep your phone and keys dry while you get wet, tested to 18.2m. Our shorts come packed in their own carry bag for easy packing. The exclusive short-run caterpillars green print is on trend with various green hues in swaying palms with hidden creeping caterpillars. Our shorts feature a waterproof wallet which slips into your back-zip pocket and will keep your phone and keys dry while you get wet, tested to 18.2m. Our shorts come packed in their own carry bag for easy packing. Our shorts feature a waterproof wallet which slips into your back-zip pocket and will keep your phone and keys dry while you get wet, tested to 18.2m. Our shorts come packed in their own carry bag for easy packing. Our model is wearing size 32 swim shorts, and usually takes a size medium/32 pants. He is 6’1” (185cm) tall with a 39” (99cm) chest and a 32” (79cm) waist. 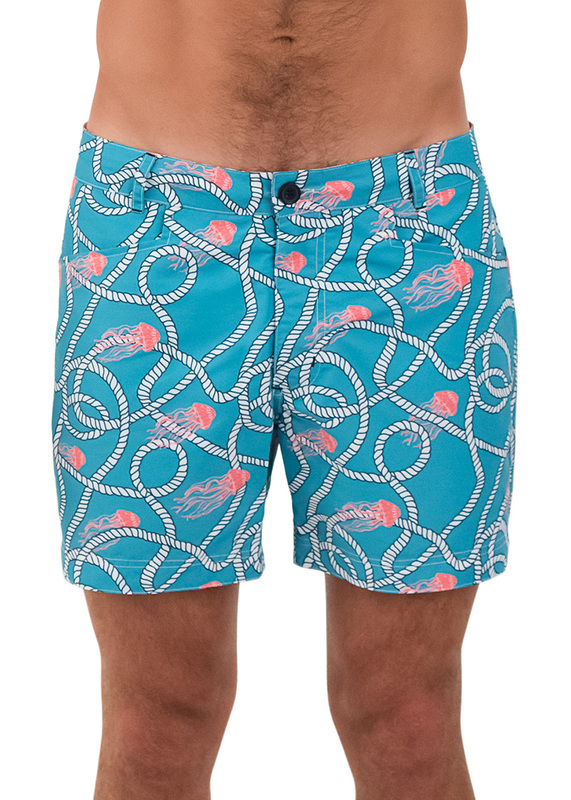 Our Shelly board shorts are the choice for those who want a shorter swim short or a more slim fit in the leg. Made from Italian yarn which is recycled drift nets salvaged from our oceans, the fabric is soft, strong and quick drying. These shorts do not have a mesh liner. The exclusive deco boats print features tiny floating boats across a soft blue sea. Our shorts feature a waterproof wallet which slips into your back-zip pocket and will keep your phone and keys dry while you get wet, tested to 18.2m. Our shorts come packed in their own carry bag for easy packing. 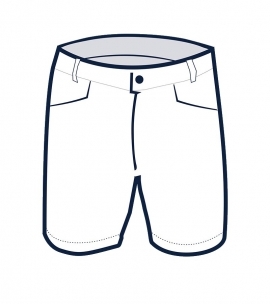 Our model is wearing size 32 shorts, and usually takes a size medium/32 pants. He is 6’1 1/2” (186cm) tall with a 39” (99cm) chest and a 31 1/2” (80cm) waist. 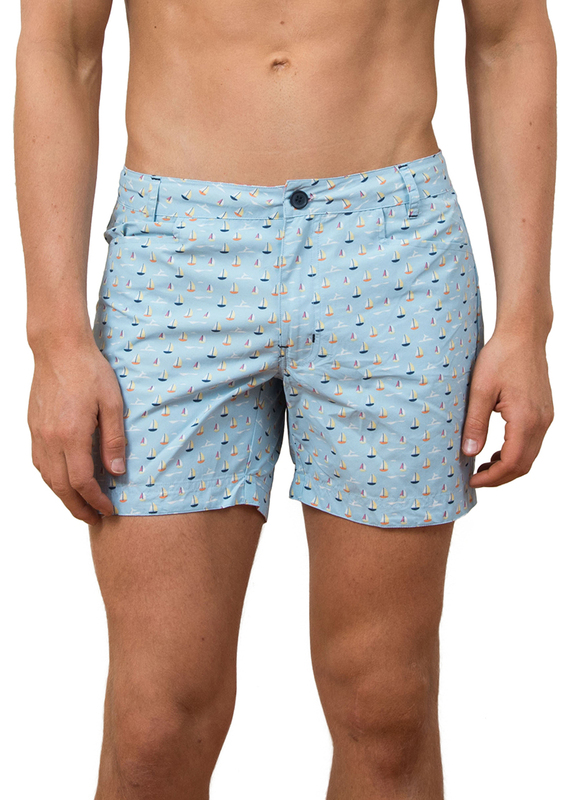 Our Shelly mens board shorts are a tailored, shorter length swim short with a slim fitting leg. Popular with those wanting a slimmer fitting short, our Shelly shorts are on trend. Made from soft and strong, quick drying nylon, these shorts feature mesh for added support. Made from Italian yarn which is recycled drift nets salvaged from our oceans, the fabric is soft, strong and quick drying and the shorts feature mesh for added support. The exclusive short-run jellies print is a bright sky blue base with white ropes and light pink jellies scooting across their path, fun and bright and very summery. 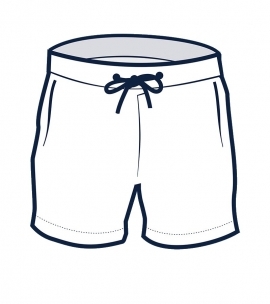 Our Shelly swim shorts are a tailored, shorter length swim short with a slim fitting leg. Popular with those wanting a slimmer fitting short, our Shelly shorts are on trend. Made from soft and strong, quick drying nylon, these shorts feature mesh for added support. 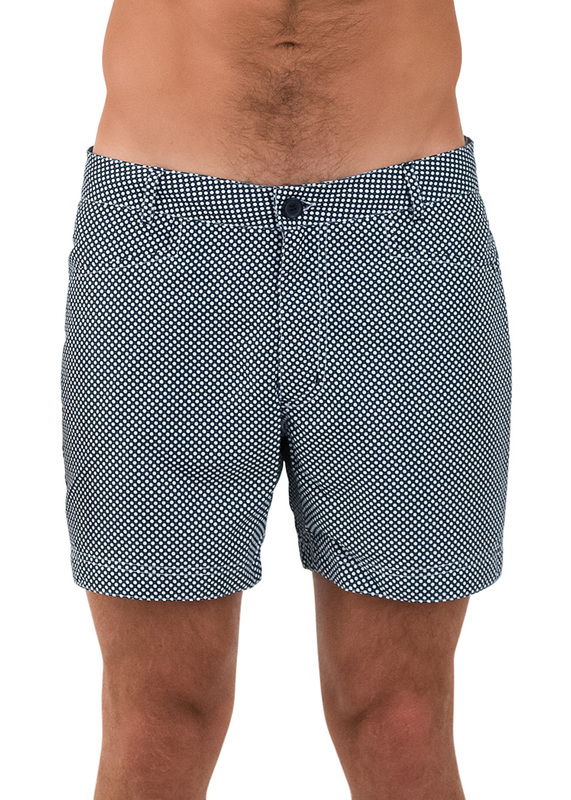 The exclusive short-run navy white spots print is a classic white base swim short with very small navy concentric circles, easy to wear beach side or barside with a white linen shirt. Our shorts feature a waterproof wallet which slips into your back-zip pocket and will keep your phone and keys dry while you get wet, tested to 18.2m. What Type of Swim Shorts? 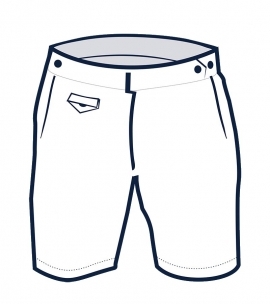 Choosing the right swim shorts for your body type is important. 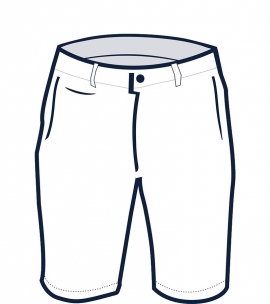 For a better understanding of which style to choose, check our our What Type of Swim Shorts are Best for you Body Type guide.